I’m Joel Carter, Director of Operations at Busy Beaver Button Co.
and Co-Currator of the Busy Beaver Button Museum. Busy Beaver Button Co. was founded by my sister, Christen Carter in 1995. Our first button customer was Guided By Voices in 1995 for Alien Lanes. We made over 4 million buttons last year. I’ve been working here since 2000. What keeps me up at night these days is restoring a 1915 brick 2 flat, making and recording music, and reading what’s happening in the news. If I do something relaxing, like watching tv or a movie, I usually fall asleep. If I do something relaxing, like watching tv or a movie, I usually fall asleep. 2. What’s the coolest thing you have seen or heard lately? I’m a vintage guitar and recording equipment collector and I saw some cool, rare vintage guitars at the guitar show in Arlington, TX this year. I’d never seen a pre-war sunburst Martin in person before. I also saw the legendary 1959 “Donna” Sunburst Les Paul which I’d only seen in pictures. 3. What’s the most exciting thing you are working on now? 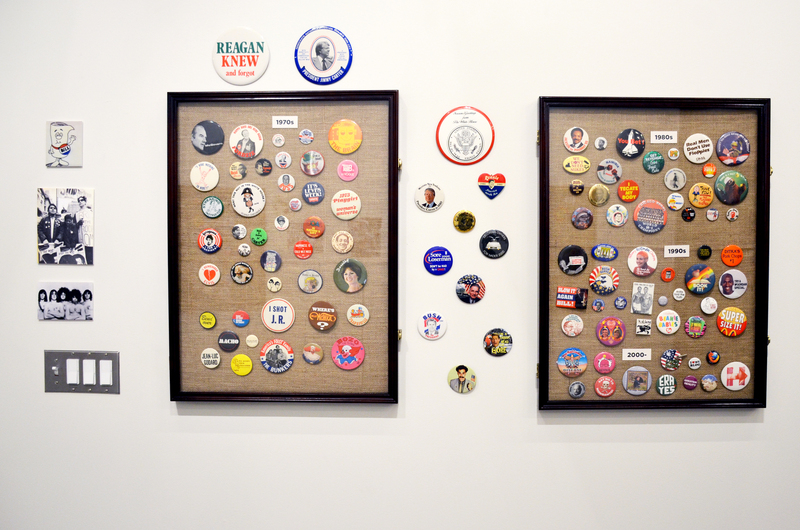 Right now, the Busy Beaver Button Museum has an exhibit at the Cards Against Humanity gallery space. It’s call “A look back, through the pinback, from 1789 to earlier today” and it chronologically covers American history from George Washington to a button made on the current day. 4. If you could add anyone alive or dead to your team who would it be? I’d probably add Ted Hake to the museum team. He is the foremost expert and literally wrote the book on the history of the pin-back button. He lives in York, PA and has an auction site that sells collectibles, including rare buttons.